In the previous update (17-Jun-2016) I discussed about the upcoming new Random Packet drop feature along with other completed features. Now I completed the entire TOFFEE-Mocha Random packet drop feature. I completed all the kernel components and the UI support of the same. And to make GUI settings more organized I split the earlier Basic-Settings page into two separate pages namely: Packet Drop and Packet Delay. So this way it is simple to understand settings according to their functionality. As you can see below the Random Packet drop feature have two options to set. The first option is to enable or disable the feature. The second option is to set its probability. If the value chosen is 1, then it has the probability of a random number between 1-10. So there are more chances that the packet may get drop. And as the way you increase this value to 2 and 3 and so on. 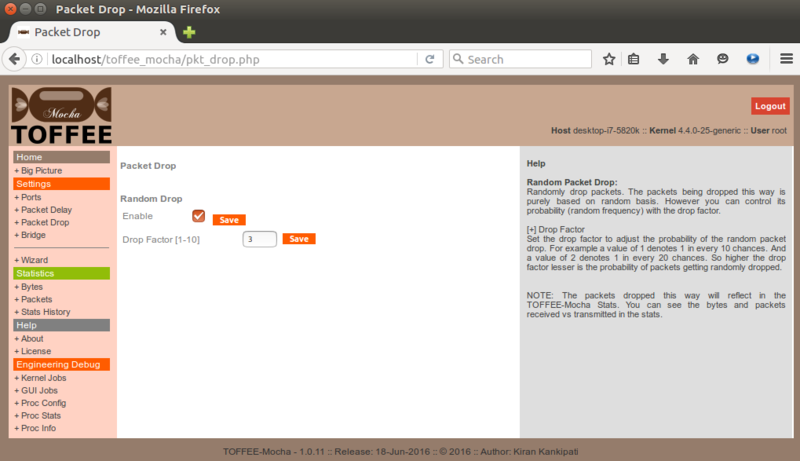 The probability of packets randomly being dropped will reduce. 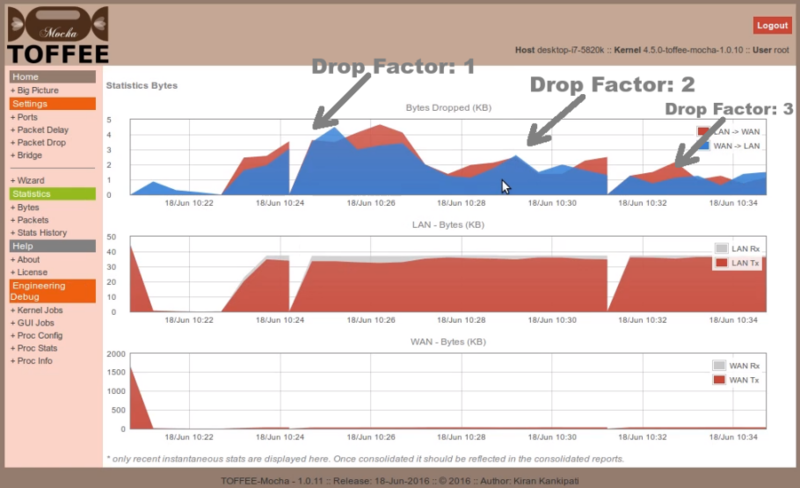 Live testing of TOFFEE-Mocha Random Packet Drop feature and test results: I did a simple setup with my PC configured as a TOFFEE-Mocha WAN Emulation device. And two laptops connected to the PC's two NIC cards. This way I can send traffic via TOFFEE-Mocha. I enabled the Random Packet drop feature and did three sample tests with drop factor value 1, drop factor value 2 and then finally drop factor value 3. As you can see below statistics depending on the drop factor you can see the probability of packets getting dropped is being adjusted. Here is the live statistics of the same. 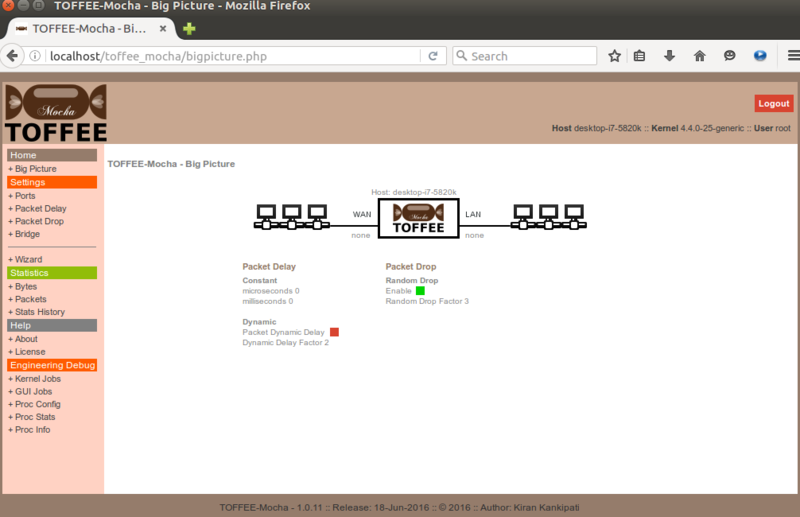 And you can see the overall consolidated report of the same in the TOFFEE-Mocha Home page. I have capture a live video (and video-log) of these tests so that you can watch it live in my Youtube video below. Along with the same I have also discussed the above features which I have so far supported and the overall project update.